Isonychias or “ISOs” for short are a very popular and productive hatch in the east and midwest. Tightlines Productions and Matt Grobert team up for this tying video with some great technique and pointers for creating parachute flies. 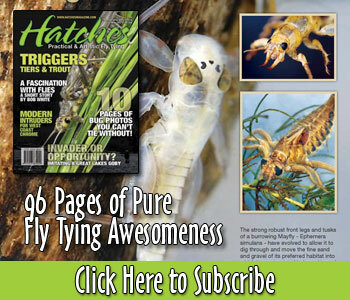 A great mayfly imitation, that can have the colors adjusted to match local hatches. The extended body is created with a single wood duck flank feather. Shot on the Missouri River near Craig, Montana, “Sipping Dry” attempts to articulate the true essence of dry fly fishing in a setting many consider to be one of the dry fly capitals of the world. The full-length version will be featured in the 2012 Fly Fishing Film Tour (thef3t.com).